Gold prices continue to consolidate trading in a very tight range. There is very little movement in the dollar, as Friday’s robust jobs report shows very little wage inflation which generates a pristine scenario for riskier assets such as stocks. Stronger jobs data should spill over into higher retail sales and eventual drive up consumer inflation buoying gold bullion prices. Trader’s will eye CPI this week, which is expected to increase by 0.2% on both the headline and core inflation rates. The daily chart of gold bars shows that prices are testing support near an upward sloping trend line that coincides with the February lows near $1,306. The 10-day moving average is seen as short-term, resistance at $1,321. There is additional resistance near the March highs at $1,342 and then a downward sloping trend line at $1,360. A break of support of $1,306 would lead to a test of the November highs at $1,299. Prices are forming a wedge pattern where energy is building as traders await a breakout or a breakdown. In fact, historical volatility is back to its lows for the year. The Bollinger band width, which is the Bollinger band high minus the Bollinger band low, shows the difference in standard deviations which is a measure of historical volatility. We have seen this volatility pattern twice since August 2017, and after approximately a month the pattern broke (shown by the purple arrows) with increasing volatility and a breakout or break down. Momentum has turned negative as the MACD (moving average convergence divergence) index generated a crossover sell signal. The MACD histogram is edging negative, and the trajectory is flat reflecting neutral to negative momentum. The fast stochastic is moving sideways generating multiple crossover signals in the past couple of weeks, which also reflects consolidation. The daily chart of silver bullion shows prices are trading sideways. The consolidation between mid-October and late November was similar. Silver bar prices have been rangebound since December of 2016. The choppy nature of the price action reflects market uncertainty. U.S. tariffs on industrial metals such as aluminum could spill over into silver prices, initially pushing silver prices higher. Support is seen near an upward sloping trend line at $16.25. Resistance is seen near a downward sloping trend line near $16.75. Momentum is neutral. The MACD histogram is printing near the zero-index level with a flat trajectory which reflects consolidation. The Bollinger band width is printing near the lowest levels seen in the past 2-years, reflecting declining historical volatility. For the 4th week in a row, silver prices have outperformed gold. After the ratio between gold and silver hit a 23-month high of $81.52, in mid-February, silver retraced some of the losses pushing the ratio back to the $79.72 level. 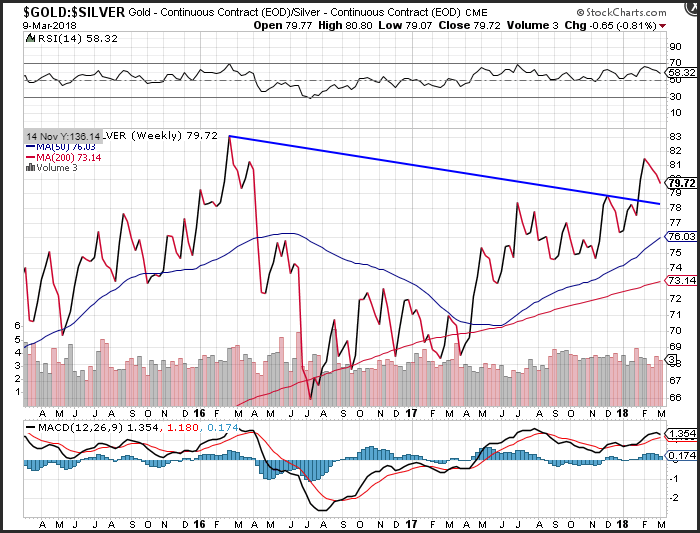 The consolidation in the pair has coincided with consolidation in both gold and silver prices respectively. Momentum on the ratio on a weekly basis is positive but decelerating, as the MACD (moving average convergence divergence) histogram prints in the black with a flattening trajectory which reflects consolidation. The RSI of the ratio appears to be declining after making a move toward the overbought trigger level of 70 just 4-weeks ago, which also reflects decelerating positive momentum.